QUITO, ECUADOR — On Monday, Ecuador’s Foreign Minister Jose Valencia denied recent allegations that his government is working with the U.K. to expel Julian Assange from the Ecuadorian Embassy in London. Last week, WikiLeaks announced that “a high-level source within the Ecuadorian state” had informed them that Ecuador’s President Lenin Moreno was plotting to expel the publisher within “hours to days,” and cited the “INA Papers” as the pretext under which they would oust him. The INA Papers — a leaked batch of documents that include Moreno’s personal emails, text messages, and family photos — have allegedly exposed his involvement in corruption and money laundering via an offshore company, as well as operations against Julian Assange. Moreno has since denied any wrongdoing but the leak, which he attributes to WikiLeaks, has led to a corruption investigation into Moreno’s activities conducted by the Ecuador National Assembly. WikiLeaks’ recent statements have also escalated tensions between the Ecuadorian government and Assange, who has maintained political asylum at the embassy since 2012. Unfortunately, this wasn’t the first time that Moreno has allegedly threatened to push the Australian publisher out. Last summer, Glenn Greenwald reported that a source “close to the Ecuadorian Foreign Ministry,” as well as President Moreno’s office, confirmed that Moreno was finalizing an agreement to “hand over Assange to the U.K. within the next several weeks.” Assange was, in fact, never handed over but there have been reports that an agreement between the two countries is still on the table. Moreno, who campaigned on former President Rafael Correa’s left-wing platform, has shifted dramatically to the right since taking office. He has also moved away from Correa’s staunch belief in national sovereignty as well as his support of Assange’s asylum. In fact, Moreno began publicly warning Assange within days of his election, leading to what has become an all-out war against the Australian publisher. Shortly after Moreno was voted into office in February 2017, Paul Manafort, of all people, traveled to Ecuador to meet with the newly elected official. According to The New York Times, Manafort made the trip “mainly to see if he could broker a deal under which China would invest in Ecuador’s power system,” but during at least two meetings with Moreno the conversation turned to Julian Assange. The Ecuadorian president expressed his desire to remove Assange from the embassy in exchange for financial concessions from the United States. However, negotiations were cut short when it became apparent that Manafort was under investigation by Special Counsel Robert Mueller as part of his Russiagate probe. Although the Times reported that there was no evidence that President Donald Trump or anyone else in his administration was aware of Manafort’s interactions with Moreno, what the paper failed to address was the fact that the woman who brokered the meetings, Ivonne Baki, is a long-time personal friend of Trump. In 2004, Baki also helped Trump organize a Miss Universe pageant in the capital of Ecuador and, in 2017, she was invited to his inauguration. That same year, Ecuador’s diplomatic post in Washington opened up and Baki claims that, during a UN General Assembly in New York, Trump asked President Moreno directly to appoint her to the position. Adding to the intrigue, in 2003, she was appointed Minister of Industries and Productivity by then-President Lucio Guitierrez, a former military officer who later supported, if he didn’t outright organize, the 2010 coup against President Rafael Correa. Interestingly, she also has an extensive history of lobbying for U.S.-based oil company Chevron. Although Ecuador and the United States have become extremely close since Moreno took office, Chevron continues to be a roadblock in their relationship. In 1993, a group of Ecuadorians filed a lawsuit against Texaco, which was later purchased by Chevron in 2001, alleging that the company had contaminated their rivers and rainforests resulting in serious damage to the environment and their health. To put in perspective the extent of damage caused by Texaco-Chevron, the contamination was 30 times greater than the Exxon Valdez spill that happened back in 1989. After a 25-year legal battle, on July 10, 2018, Ecuador’s National Court of Justice in the Constitutional Court of Ecuador upheld a $9.5 billion judgment against the oil company for “having caused one of the greatest environmental disasters in the world.” It has since been reported that the U.S. is pressuring Moreno over the judgment, although some have suggested that Chevron caved on the $9.5 billion in exchange for Julian Assange. It’s interesting to note, however, that during a May 2018 AS/COA co-hosted conference in Ecuador, the government announced that it expected “to receive investments of 7 billion dollars between 2018 and 2021” — almost 90 percent of what Chevron now owes for destroying their environment. Chevron is a member of the AS/COA and whether or not the two potential bounties are related remains to be seen. Kevin Koening, the coordinator for Amazon Watch, called the proposal a “multi-billion dollar bait and switch,” and Anderson went on to point out that in 1989, Baki signed a letter addressed to a U.S. judge asking that the case against Chevron be dismissed. She also “helped organize and participated in several meetings between Chevron and high level Ecuadorian officials,” and was an active participant in Chevron trying to influence U.S. lawmakers to cancel U.S. trade preferences in response to the lawsuit. So despite the lack of evidence that Trump or other officials were aware of Manafort’s negotiations with Moreno, Baki’s close relationship with both Trump and Moreno, her lobbying history with Chevron, and her ties to the Clintons all call into question whether or not Manafort was really working on his own when he landed in Ecuador. By mid-2017, Sweden had closed its investigation against Assange and the United States began to focus its attention directly on its relationship with Ecuador. In September, Ecuador’s Minister of Foreign Trade, Pablo Campana, publicly stated that Ecuador was “hoping to mend fences with the International Monetary Fund (IMF),” making it clear to the U.S. that Ecuador was open for business. At the time, the country was suffering from a $3.5 billion budget gap, along with an expected $6 billion deficiency the following year. According to Campana, the closer Ecuador could get to the IMF, the better. However, Whitney Webb, a journalist for MintPress News, reported on the IMF earlier this year, noting that a U.S. Army manual published by WikiLeaks in 2008 described the IMF as a “financial weapon” used by the government. It’s unlikely that Moreno wasn’t aware of the ramifications of tying up the country with IMF loans, such as “labor flexibility” — also known as mass layoffs — and privatization. After all, he was serving as vice president under Rafael Correa when Correa kicked the IMF out of the country in 2007. But despite the U.S. dangling what can only be described as a financial stranglehold over Ecuador for its own gain — whether it be more open markets in Ecuador for private investment or Julian Assange in custody — Moreno plowed ahead. On February 21, 2019, the Ecuadorian government inked a deal for a total of $10.2 billion in IMF loans. Campana also signaled to the U.S. that Ecuador “was eager to settle a long-simmering dispute with Chevron Corp,” and that it was time to clean up “whatever has to be cleaned and try to solve this issue which would be best Ecuador, Chevron and the U.S.” Webb reported in her article that “previously, authorities could not interfere with the spills because the pollution was used as evidence in lawsuits against Chevron,” so Moreno’s move to clean up the contamination/evidence may be a signal that the Ecuadorian government is looking to dismiss the claims. 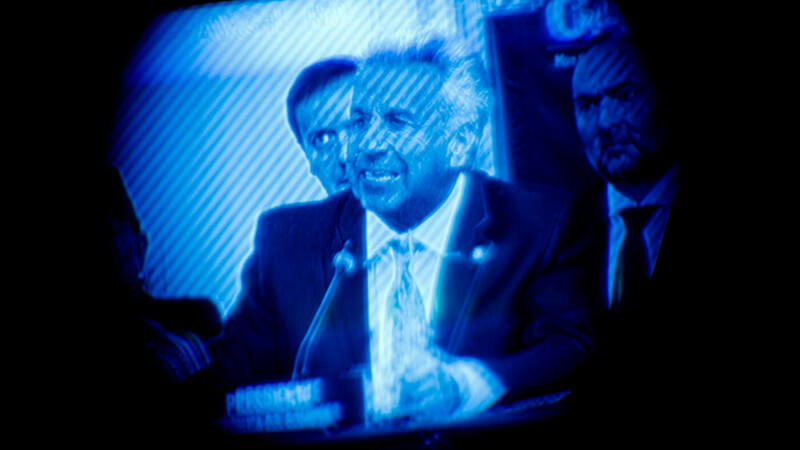 By September 2018, things appeared to be going exactly as President Moreno had planned — he had opened the country up for business, obtained over $7 billion in foreign investments, was in the process of netting a lucrative IMF deal, and progressing towards an amicable, if not illegal, solution to the Chevron problem. However, if the United States had indeed demanded Julian Assange in return for concessions, as WikiLeaks proposed this past January, Moreno had a problem. In December 2017, Ecuador granted Assange citizenship, affording him protection under the country’s constitution, which bans the extradition of nationals. Thus, when Ecuador Assembly member Paola Vintimilla announced that there were irregularities with Assange’s naturalization nine months after he received it, it appeared that the Ecuadorian government was making a move to strip Assange of his constitutional protections in order to pave the way for extradition to the United States. Vintimilla requested Assange’s citizenship papers and, miraculously, an hour before the Assembly was set to vote on whether or not those documents should be unclassified, she received a letter originally sent to the president of the Assembly from the minister of foreign affairs, Jose Valencia, indicating that the documents were no longer classified, as they were a matter of public interest. Vintimilla accused former government leaders of lying about the classification in the first place and stated that the papers would be available for any Ecuadorian citizen who requested them. “I won,” she declared on Twitter. But what Moreno, Jose Valencia, and Paola Vintimila didn’t anticipate was a website called inapapers.org publishing stolen emails from Moreno’s gmail account. Mangas also noted that the documents had been inexplicably sent to the media, including 4Pelagatos and PlanV, which use serial propagandist and Guardian writer Fernando Villavicencio as their mouthpiece. “Since the evil is done, the effects of this unexplained situation must be controlled,” uttered Mangas. But, based on subsequent emails sent from Mangas to President Moreno, the situation did not improve. By the end of October 2018, the Ecuadorian media outlet 4Pelagatos had run at least a dozen stories about Assange within a two-week period that included allegations former Ecuador Foreign Minister Maria Fernanda Espinosa tried to deceive the U.K. over Assange’s diplomatic appointment (which the U.K. subsequently denied) and that the head of the National Assembly, Elizabeth Cabezas, tried to hide Valencio’s letter stating Assange’s citizenship papers were unclassified. Although the INA Papers have been reported in the press as a collection of documents that have implicated Moreno in a corruption scandal, they have also exposed his alleged operations against Julian Assange, a legitimate publisher and journalist whose only crime has been to expose corporate and government corruption. After the INA Papers were released, online Twitter account Anonymous Scandinavia (@anonscan) appears to have been the only one to report on the damning Mangas emails. Much to Moreno’s chagrin, the inapapers.org website also published photographs of him and his family traveling around the world and enjoying the great outdoors while Assange remains imprisoned in a stale, cramped room under constant duress and Moreno’s crippling protocols. But his dismal record on taking into account Assange’s press and speech freedoms as well as his liberty is hardly surprising. Three days after Moreno was elected president on April 2, 2017, he lashed out at Assange, ordering him “not to meddle in the country’s politics,” after Assange tweeted about former presidential candidate Guillermo Lasso. Since that time, Moreno has spent two years trying to manipulate Assange’s asylum in order to remove him from the embassy. In the last week, Moreno has blamed WikiLeaks for the publication of the INA Papers, alleging that Assange was behind the hack. However, the Ecuadorian president has provided no evidence whatsoever for the allegations, despite publicly announcing that he knows who was behind the attack. Johansen raises an interesting point. These latest reports that Ecuador is threatening to expel Assange are reminiscent of Greenwald’s prediction last summer, which wasn’t necessarily erroneous at the time but does call into question whether nefarious forces are setting the stage for an anesthetized and nonreactive public when grab teams actually go in to arrest Assange. The public as a whole can not and will not remain on a heightened sense of alert forever and the government — whether it be the United States, United Kingdom, or Ecuador — knows this. However, there has been an undeniable string of red flags indicating that Moreno is indeed working with both the U.K. and U.S. to hand Assange over to authorities: Tightening bilateral relations with the U.S., including military support; Moreno’s early negotiations with Manafort; turning off Assange’s internet and jamming his phones since March 27, 2018; limiting visitors; ambiguous protocols that Assange must follow that have no legal backing; signing a multi-billion dollar IMF deal; and trying to work out a solution to Ecuador’s Chevron problem. Whether or not the public is being played by state actors remains to be seen, but Johansen’s observations shouldn’t be casually dismissed either. On April 5, the United Nations Office of the High Commissioner (OHCHR) released a statement that Special Rapporteur Joe Cannataci has plans to visit Assange on April 25. The Office also released a timeline of events that show Cannataci was forwarded a complaint on March 29, made by Assange’s legal team stating that his privacy had been violated. Cannataci made several attempts to visit Assange that same day while in London but Ecuador never responded. When, two days later, he formally requested a visit with Assange and on April 2, the Ecuadorian Ambassador to the U.K., Jaime Marchan Romero, told him that the request had been forwarded to “the authorities in the capital of Ecuador.” Interestingly, an hour later, Cannataci received another complaint, this time from Ecuador Foreign Minister Jose Valencia stating that President Moreno’s privacy had also been violated via the INA Papers. Cannataci was forced to cancel plane tickets to London the following day after Ambassador Romero suggested he do so. But despite Ecuador’s political shenanigans, Cannataci has since secured a meeting with Assange on April 25. In the meantime, Ecuador continues to deny any imminent plans to expel Assange while reserving the right to investigate him for the INA Papers. The country has also stated in the last 24 hours that it will be “reassessing its asylum for Julian Assange,” while embarking on a new campaign to push the idea that Assange was granted “diplomatic,” rather than “political” asylum. However, it must be remembered that Assange was granted political asylum based on the fact that he faces political persecution at the hands of the United States — Ecuador cannot dictate the terms of his asylum as it sees fit; the U.N. cessation clauses obligate Ecuador to honor his asylum until the threat of persecution no longer exists.